We’re sure you’ve heard the common catchphrase, “Knowledge is power”. Over and over it's been shown that education is one of the most powerful tools we have for creating change in the world. Since education is a lifelong journey, we’ve compiled a list of our top five reads for change-makers. Whether you’re passionate about eradicating poverty, providing global education, engaging in social entrepreneurship or improving your leadership skills, these books will undoubtedly inspire you to take action today. This heartening narrative highlights the power of ordinary citizens to be global innovators, and provides pragmatic solutions to some of our world’s most pressing challenges. Using research and on-the-ground reporting, Kristof and WuDunn evaluate the impact of altruism, explain how giving can benefit the giver, and explore how we, as everyday change-makers, can make the most effective impact in our communities. Seven years ago, three Melbournian friends had a crazy idea: What if the revenue generated by everyday purchases, such as bottled water, could help end extreme poverty? The Thankyou project grew from there, and today is one of the most successful and impactful Australian social enterprises of all time. 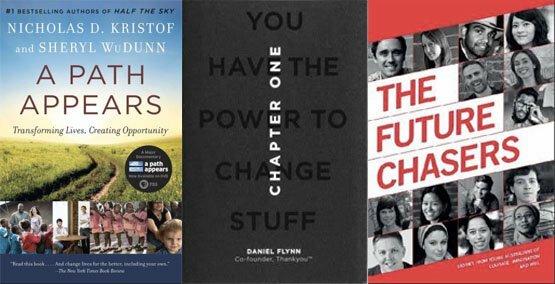 Co-founder, Daniel Flynn, shares their story and provides a multitude of handy tips and advice about business, marketing, and social entrepreneurship, for all the changemakers out there who have yet to realise their own “crazy” ideas. Future Chasers features fifteen outstanding young Australians who have accomplished remarkable things in politics, technology, medicine and the arts. Through their innovation, passion and determination, these young leaders are throwing off the negative societal stereotypes about Gen-Y and proving how powerful young people really are. Muhammad Yunus, winner of the 2006 Nobel Peace Prize, explores how the “social business model” has been implemented by corporations, entrepreneurs and social activists worldwide, revolutionising the global business sector and transforming lives. Using case examples, he explains how the model can be used to fulfil human needs, and provides practical guidance to those who want to start up their own social business. Drawing on his work in Bolivia, Russia, India, China and Africa, Sachs presents a range of innovative solutions to some of the interconnected economic, political, environmental and social challenges faced by developing countries worldwide. This accessible overview of the global economy helps readers to understand not only the severity of these challenges but also what actions can be taken to address them. A film crew followed her around for the past week. I'm not sure when the film is coming out, but it sounds as if there will be a great documentary on her project, 10-15 min. long, sometime in the next six months or so. If I forget, ping me if you remember and I'll send you a link. Sounds like they got a lot of great footage. Yes, she is training them. For the area she is in, it is a sophisticated process. Very simple machinery, but levels of precision, sanitized surfaces, and temperature, dust, etc. that are not familiar precautions. While the local hospital is good, she is training them to work to much higher standards than the local hospital. She is producing skin care products that need to meet the standards of the most demanding and sensitive US customers. Her employees are learning a lot. It is profoundly helpful to have a Senegalese explaining the importance of these issues to them. She says sometimes they don't take it seriously when white people try to get them to adhere to developed world standards - they take it as a sort of superstition or fetish on our side. She has credibility there that outsiders will never have. @MichaelStrong Sounds interesting. I am guessing she sets up local people for implementation and production?